Why are the BBC running blatant distraction propaganda for the Tory party? A little over a month ago the Tory party took a £30,000 donation from the wife of a former finance minister in Vladimir Putin's government. 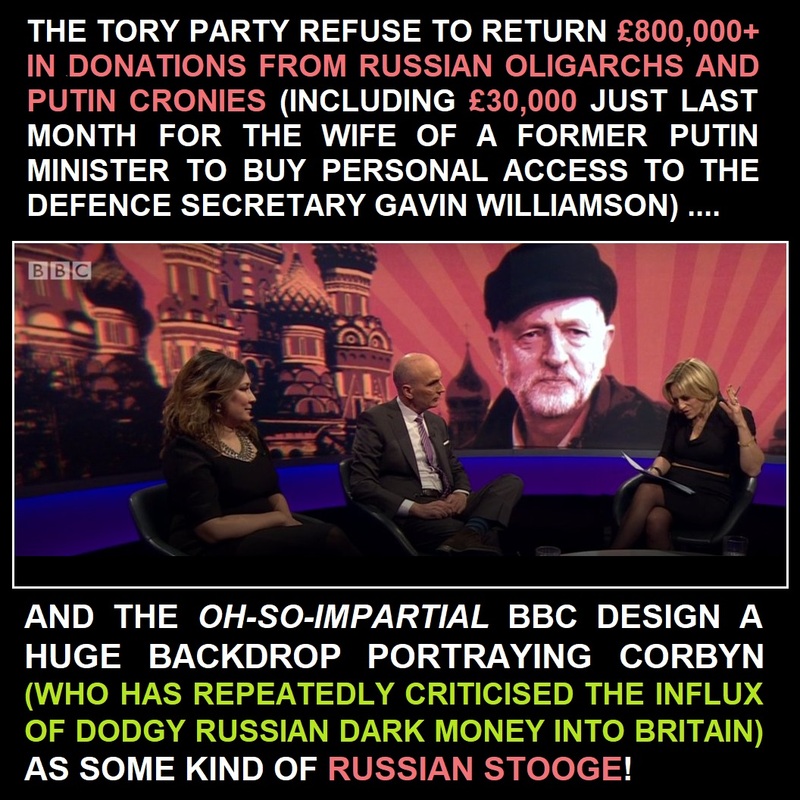 The donation was in fact a bribe to buy personal access to the Tory defence minister Gavin Williamson, and this is far from the only donation the Tories have taken from Russian oligarchs and Putin cronies. 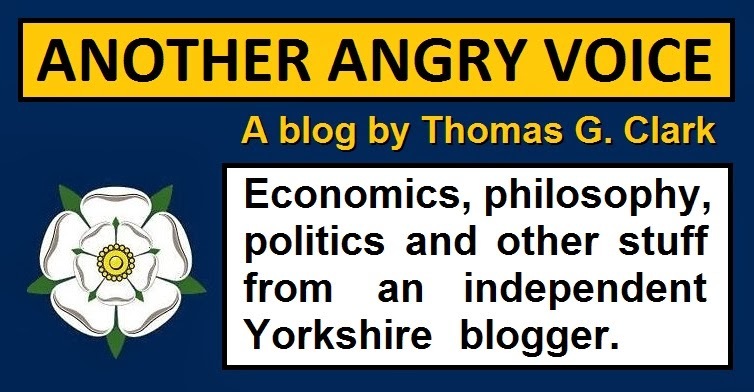 They've raked in over £800,000 since Theresa May became Prime Minister, and over £3 million since 2010. The obvious question these donations raise is what are these Russian oligarchs and Putin cronies buying with these donations. People don't just hand over vast sums of money for nothing, so they must be expecting some returns on their investments. One possible answer is the way the Tories have steadfastly obstructed moves to introduce so-called Magnitsky powers to bar Russian officials from the UK if they're suspected of war crimes, human rights abuses, or crimes against humanity, and to stem the flow of Russian dark money that is flowing into the City of London. 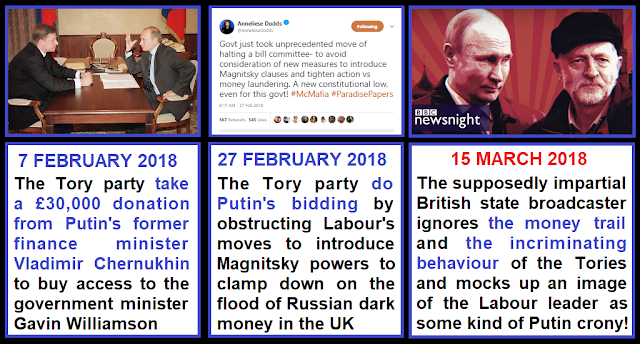 Blocking and overturning Magnitsky powers has been described as Vladimir Putin's top foreign policy objective, so when the Tory party took the unprecedented step of halting a committee meeting on the Sanctions and Anti-Money Laundering Bill in order to avoid consideration of Magnitsky powers on February 27th, just three weeks after taking a £30,000 bung from the wife of a known Putin associate, it's hard to draw any other conclusion isn't it? And now, despite this damning evidence against the Tory government (money trail and incriminating behaviour), the mainstream media are uniformally attacking Jeremy Corbyn and the Labour front bench in the wake of the Salisbury nerve agent attack as if they're the Russian stooges! Corbyn has been condemned for "political point scoring" for pointing out the huge flow of money from Russian oligarchs and Putin cronies into Tory party coffers, his concerns about the Tory blocking of Magnitsky powers have been routinely ignored, he's been attacked on the front pages of the right-wing propaganda rags as a "Kremlin stooge" and Putin's puppet", and the supposedly impartial BBC made up a huge backdrop portraying Jeremy Corbyn as some kind of Russian agent! These kinds of partisan attacks are to be expected from the right-wing propaganda rags, but when the BBC state broadcaster is spewing the kind of biased, reality-reversing pro-government propaganda you'd expect to see in Putin's Russia, questions really need to be asked. Aside from the incredible bombardment of reality-reversing propaganda portraying Corbyn as the "Russian stooge" when the money trail points clearly and undeniably at the Tory party, another interesting question comes out of all of this. If one of Putin's top foreign policy objectives is preventing Magnitsky powers, and the Tory party were gladly doing his bidding by brazenly obstructing political efforts to introduce these Magnitsky powers in Britain, why on earth would they jeopardise their main objective by launching an unprecedented chemical weapons attack on British soil against a retired spy they released from prison years ago? Of course it's possible that the Russians are so arrogant that they think they can get away with carrying out a chemical weapons attack deep in NATO territory, but even the most rudimentary Russian consideration of the likely outcomes of such an attack would surely have raised the probability of Magnitsky powers being imposed in retaliation. Of course I'm not arguing that Russia didn't carry out the attack because I'm not privy to the chemical analysis, or any of the intelligence material on the case. To make such a judgement without firm evidence would be to wander off into bonkers conspiracy territory. 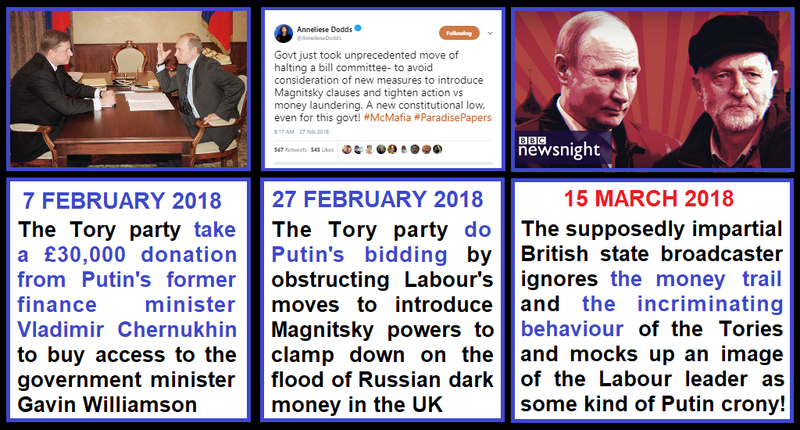 However, given the fact that Putin is usually a very smart operator, I think the question of why he would green light such a brazen attack on British soil is a pertinent one, especially given the way the Tory government were pliantly doing his bidding just a few weeks ago by obstructing efforts to impose Magnitsky powers in the UK. 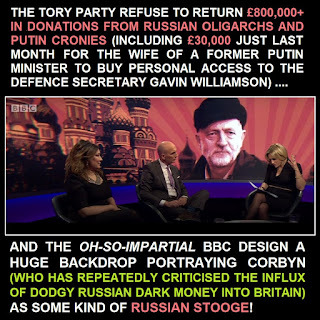 The other pertinent question is why almost the entire UK media has rounded on Jeremy Corbyn to misleadingly present him as some kind of Russian stooge when he's the one who has been pushing hard for Magnitsky powers, and completely let the Tories off the hook for their extremely dubious donations from Russian sources, followed just weeks later by their deliberate obstruction tactics to undermine the implementation of Magnitsky powers. There's clearly something dreadfully wrong with the BBC that they're ignoring this compelling evidence against the Tory government and running the kind of flagrant pro-government, anti-opposition propaganda you'd actually expect to see in Putin's Russia.